PT Astra Graphia Tbk (Astragraphia) is an subsidiary of Astra International Company and also part of distribution network from Fuji Xerox Co. Ltd in Asia Pacific. In Indonesia, Astragraphia also well known as exclusive distributor for any product from Fuji Xerox Indonesia, which provide the best document solutions, technology and information. Along the way, Astragraphia Document Solution began to transform from hardware-based service provider to solution-based service provider. And Next Digital is proud to be a part of the Astragraphia progress and innovation, to become the leader for document solution in every Indonesia office needs. Aware with the higher competition level in the industry, Astragraphia realize that they need to make significant breakthrough in Digital. And that?s where Next Digital play important role in the process. As a Digital Agency, we understand that a good start in digital begins with a solid foundation. So we have to face the challenge to create a solid, powerful, and structural foundation for Astragraphia, carry forward their offline asset into online to reach their new target market in digital, ?introducing? their presence in digital, and of course to drive sales. As mentioned before, we start to make a solid foundation in digital by creating official corporate website, www.documentsolution.com as a place of any information about Astragraphia products and services. In line with that, our creative team also create many brilliant ideas for social media maintenance and monthly activation, based on our deep research through their consumer behavior. 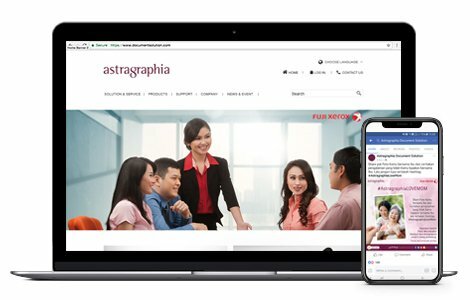 Not only that, Astragraphia with Next Digital Indonesia decided to publicize their service, products or promo by using Google Display Network and Search Engine Marketing, in order to drive their sales in online.